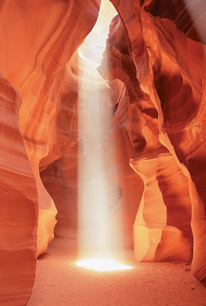 ●Tour both Monument Valley and Antelope Canyon on the same trip - led by Indians! Just as with our tour that visits only Monument Valley, this tour departs from the Grand Canyon airport. You'll climb into a small airplane, for a picturesque flight to Monument Valley. On the way you will fly over the Grand Canyon, before taking in some of the famous monument and rock formations from the air, as you approach Monument Valley. After landing, your Navajo (Indian) guide will be waiting for you in a specially converted off road vehicle, to take you for a back country tour of the wonders of Monument Valley. Amongst the sights you will see are mesas, buttes, fingers and other rock formations, as well as hogans. You will have the opportunity to purchase Navajo jewelry from the Indians who have made it, before taking off for Page. The flight goes over Lake Powell - an incredible sight from the air. 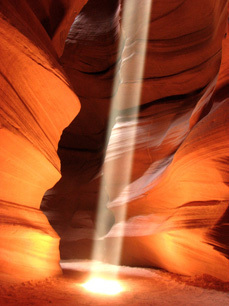 When you land in Page another Navajo guide will pick you up for your tour to Antelope Canyon, possibly the most beautiful canyon you will ever see in your life. The picture opportunities are amazing. After touring Antelope Canyon your guide will drop you off at the airport for the flight back to Page. More details of the tour can be seen here. You can also order the tour. If you prefer it, we have another tour that only goes to Monument Valley.